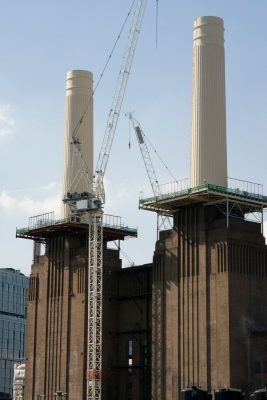 30 August 2017 – Battersea Power Station (BPS) is pleased to confirm that the painting of all four chimneys is now complete, earlier than expected. All four chimneys received a base coat and final coat of paint in the exact colour the originals were painted in to ensure they are visually identical. “An exciting new skyline is developing at Battersea but it is fantastic to see our old friends, the Power Station chimneys, restored to their former glory: a proud landmark for Wandsworth and for London. Battersea Power Station’s four iconic chimneys have been rebuilt using the same construction technique as when they first graced London’s skyline. 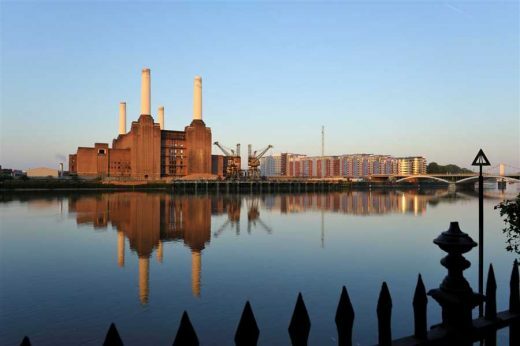 The Battersea Power Station Development Company has applied for permission to change the sequence in which the listed building’s chimneys are rebuilt. Back in 2011 Wandsworth Council and English Heritage approved plans for each of the decayed chimneys to be rebuilt after successive engineering studies showed all four were beyond repair. A legal agreement between the council and the sites owner stipulates that they must be rebuilt one at a time. The new application – called a deed of variation – proposes a change to the legal agreement so that the first chimney could be rebuilt on its own, then the remaining three would be rebuilt at the same time. 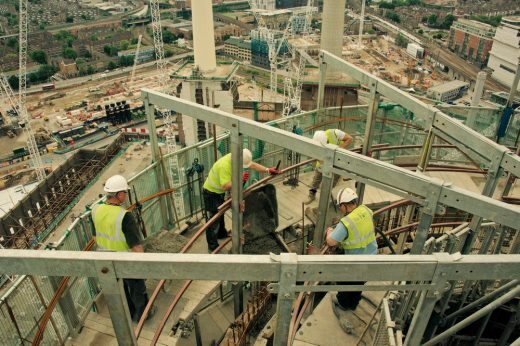 A new safeguard would also be added to the legal agreement which requires the developer to provide a bond for the full value of the chimney works contract before the project can get underway. The council could use this bond to pay for the completion of the project if for any reason the developer failed to finish. No changes are being proposed to the design of the chimneys which would be constructed according to the original architecture plans so that they match the appearance of the originals. The development company estimates that changing the sequence of the chimney works would mean the power station restoration project could be completed two years earlier. Council planners are now examining the application in detail. A final decision on whether to approve the proposals will be made by the council’s planning applications committee. View the application online at www.wandsworth.gov.uk/planning – reference number 2013/3076. Battersea Power Station is a privately owned Grade II* Listed Building which has reached a dangerous state of disrepair. It was decommissioned almost 30 years and is now on the English Heritage Buildings at Risk Register. 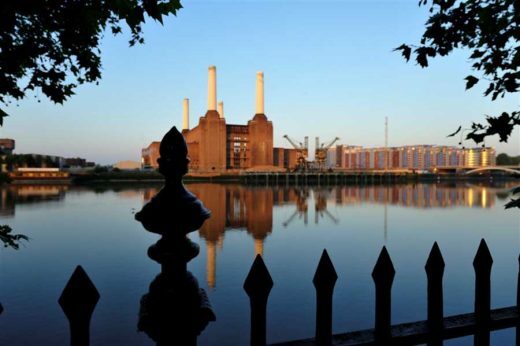 In 2011 Wandsworth Council and English Heritage approved plans to restore Battersea Power Station and replace its four severely decayed chimneys which are approaching the end of their intended lifespan and are beyond repair. The project, which is backed by the Mayor of London and the UK Government, will see each chimney rebuilt using the same material (reinforced concrete) and working to the original architectural plans. Their appearance will be as close to the original as possible. The damaged structure of the power station building will be restored, including repairs to the external brickwork, washtowers, the steel frame and the windows. As a listed building project, the work will be strictly specified and monitored to ensure an accurate historical match with the original features. Once structurally secured, the building will be refurbished to create a vast mixed use complex including exhibition spaces, galleries, shops, leisure facilities, bars, cafes and restaurants. The surviving heritage features within the buildings interior will be restored and preserved. All four chimneys, which are made from layers of reinforced concrete, have deep cracks in many places and fragmented surfaces. There are also splits between the layers of concrete which make up the chimney structures. They are now approaching the end of their intended lifespan and tests show that the concrete now has high chloride content, is carbonated in places and the steel reinforcements are corroded. Following successive engineering studies Wandsworth Council and English Heritage agree that none of the chimneys could be repaired to a lasting and safe standard. The risk of concrete falling is too great and they would need an unrealistic level of on-going maintenance and repair to prevent them from deteriorating. As a result there are related public safety issues and potential difficulties in obtaining adequate insurance. • The site owners cannot start work on the first phase of the development project until a full contract has been let for the rebuilding of the chimneys. • The site owners cannot start work on other phases of the development project until certain milestones in the restoration of the power station and its chimneys are reached. • Other parts of the development project cannot be occupied until certain milestones in the restoration of the power station and its chimneys are reached.